Suha Arraf was born in the Palestinian village of Melyia, near Lebanon. She began her filmmaking career as documentary producer. Her latest one; Wowmen Of Hamas (2010) received 13 awards at international film festivals. 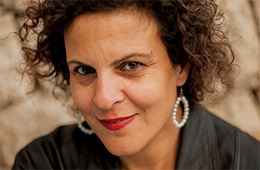 Suha’s first two screenplays, The Syrian Bride (2004) and The Lemon Tree(2008), both directed by Eran Riklis, received international acclaim, with the latter winning Best Screenplay at the Asia Pacific Screen Awards. In 2014 Suha was listed in Variety Magazine’s “Top 10 Screenwriters to Watch” and was writer-director of Villa Touma. Villa Touma is showing at The Courtyard Arts Centre as part Borderlines Film Festival (Saturday 14th March) and at of The Watershed (Sunday 15th March).